Have you heard of a small island called Tuvalu? If you haven’t, you are not alone, but click here and you can find it. That’s right – it is no where near Tonga! Tuvalu is home to about 10,000 people, and is one of the least populated countries in the world. There are two special people from Tuvalu here in Tonga, one is little ‘Asia. Being such a small nation, it is impossible for Open Heart International to get there. The small population means it is impractical to send a visiting team, plus small planes make it impossible to get our equipment there. But what happens when you live in Tuvalu and you need a complex operation? Most of the time they will head to Fiji if it cannot be done in Tuvalu. However with such a massive need for cardiac surgery in Fiji, it is difficult for additional patients from Tuvalu to be seen. The Tuvalu and Tongan Ministry’s of Health came to an agreement this year to allow two patients from Tuvalu to come to Tonga for surgery with Open Heart International. 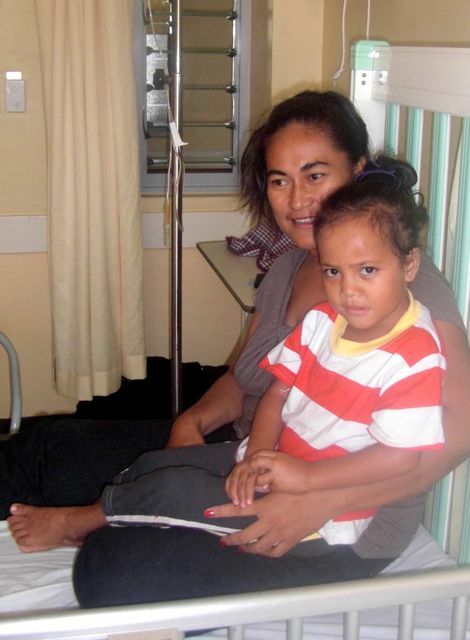 ‘Asia flew from the main island of Funafati, to Fiji, and then to Tonga with her mother and doctor. She’ll be here for about a month all up depending on how quickly she recovers from surgery. Smaller nations coming together is a great concept and we’ll be interested to see if we can support this concept again in the future.